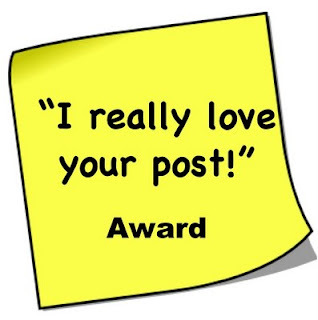 Stephanie over at Diapers and Divinity recently thought up a wonderful blog award called the Post-It Note. (Actually, I'm not sure if that is what it is called, but that is what I am calling it, anyway.) I was lucky enough to receive it from her, because she liked my post, Certainty. So, first of all, thanks to Steph for totally making my day. That day was one where I needed a bit of a pick-me up, and this award definitely fit the bill. Before I unveil the post that really struck a chord in me and made me think a lot on it, I must first tell you a bit of backstory. As you know, I have three beautiful children. What you may not know is that, while I definitely wanted to become a mother, once I became a mother (9 years ago yesterday), it just didn't come as easily to me as I had hoped. It is hard for me to lay aside my own desires in life and really concentrate on what is best for my children. Maybe I was a little surprised at the sacrifices that motherhood requires. Maybe I was selfish. I don't know. I am sure this is not anything abnormal, but I have always felt a little guilty for those feelings, especially in the LDS culture. Something else you may not know is that we have been trying to have another baby for quite some time now. Long enough, that I really should have a newborn by now, but it has never been super easy for me to get pregnant. Recently, as I was going around my house doing all those things that mothers do every day, it dawned on me that I was totally fine if my three daughters are the only children I am destined to have. I feel like I should have another baby, and I even want to, but I am fine if I don't. And knowing that I would be fine with only three also makes me feel just a little bit guilty. When I read Emily's post on her blog (which it looks like she is retiring), pointing out her contributions to this quarter's Segullah magazine , I clicked on through and read. Her piece, Finding Myself on Google, brought tears to my eyes, and validated so many of the feelings that I have previously felt guilty for having. It reconfirmed just how important motherhood is, but didn't deny how difficult it can be at the same time. And mostly, it helped me to remember that God knows me, knows what I can and can't handle and that if it is His will for me to have another child, it will happen. Because honestly, as much as I think having another baby is the right thing to do, I'm not sure I could really handle it. And that's okay. Because I have a wonderful family as is. So, go read Emily's post and just try not to be inspired by it. Thank you for this post. And for the link to Emily's. I had a very similar experience when I first became a mother. I had gone from the limelight with the Utah Shakes Fest and instant gratification of applause and autographs, lead roles in the shows at school, solos with the school choir, and basically feeling on top of my game to becoming a mother. Where, as you well know, there is NO gratification to begin with. No "thank you Mommy for cleaning up my third poopy blow out in 5 hours" or "Thank you for continuing to try and breastfeed me even though it makes you hurt really bad." I didn't have those "natural" motherly feelings either. I really struggled with it. Fought "against the grain" so to speak for a good year. My mom gave me a book called "I am a Mother" by Jane Clayson Johnson. (HIGHLY recommend it!) It talks about a lady who was a news anchor/reporter for CNN (i think?) or another big name news broadcast and then she became a mother. SAME experience. Maybe I should blog about it. Anyway, thank you for letting me know that I am not alone in my feeling sometimes. I had a good friend tell me how she loved the bonding that came from nursing. At the time I only had one child, and I couldn't agree with her. I didn't mind nursing, but I really didn't feel the bond she talked about. The first baby was hard in so many ways, but mostly emotionally for me. I could related in many ways to your post and Emily's. Baby number two was easier in many ways, and it must have been because I had changed. :) I really hadn't thought about it like that before, but it makes perfect sense. And, with baby #2, I really did get to feel that bonding. That sounds like a great article I should read. Your comment about feeling a little guilty knowing that you would be fine with only three kids made me stop to think for a minute. I am fine with only having my two, do I feel guilty about that? No, should I? Then I clicked over to Emily's article and read it. I could completely relate to her experience of knowing who her children were, even their names, before having them and her thought that it was a way to prepare her really made me think. I have known my children's names since I was 16, 4 years before my first was even conceived. I even knew which one would be first. I had never thought of it as a tool for preparing me for these children, but now I can see how it probably was. As a teenager I didn't want to ever have children (I know, scandalous for a girl raised in our church), and I think learning their names was a way to prepare me for the fact that I would be a mother. Once I became pregnant I knew that I wanted to be the best mother I could be. I would breastfeed for at least the entire first year and everything. Then there were complications at birth and complications with breastfeeding. My first child was completely on bottles by 5 months and my second by 2 months. My body can still get pregnant but going through births can be dangerous for me so I have learned to be ok with only having these two. I think that knowing about these two children from early in my life also prepared me for the knowledge that they may be the only ones I have. Thank you for the post and the link to that article, I needed something like that today. "while I definitely wanted to become a mother, once I became a mother (9 years ago yesterday), it just didn't come as easily to me as I had hoped. It is hard for me to lay aside my own desires in life and really concentrate on what is best for my children. Maybe I was a little surprised at the sacrifices that motherhood requires. Maybe I was selfish. I don't know. I am sure this is not anything abnormal, but I have always felt a little guilty for those feelings, especially in the LDS culture." Wow, Lara, thank you. I'm really glad Google struck a chord with you (and your readers). It's funny because I'm going through the same thing again right now, trying to figure out if and when to have another child. You would think that, having written about it once, I would have processed all the issues already, but no. Is it okay if I mention that there's an improved version of that essay in _The Mother in Me: Real-World Reflections on Growing into Motherhood_? (it's at Deseret Book) A lot of the pieces in that book deal with that same tension, between wanting to be a good mother and knowing it's the right thing to do, and then discovering that it doesn't always come naturally. And also is it okay if I don't pass on the blog award? I know it is bad blogging etiquette, but I am trying to use my writing time/energy to plan my Nanowrimo attempt. So I'm letting it rest for a while, but please know that I really appreciate your reading and linking to the essay. You have always been generous with me, Lara. I read and was inspired by both Emily's and your posts. You are a wonderful mother, you have a beautiful family. Be glad you chose motherhood over all the other stuff, for that is what you take with you when you leave this life. Great Post Lara! I've been out of town for a few days, so I'm just catching up on all your recent posts. (Wonderful, as always!) Just wanted to send you my best wishes and hopes for a new baby, if that's what's in your future. It sounds like you have a wonderful attitude about the whole thing, however it turns out. All the best for you and Joel! I guess for me, right now, Motherhood is the greatest among my blessings. When Isaac died, some of my dreams died with him. God took Isaac home, and through that experience, I have learned to cherish and love every second of motherhood, to not take it for granted, knowing one day I will miss it, and knowing every day what a gift it is to have my living children. That is not to say that I am perfect at it - - quite the opposite - - but I can truly say I love it, and eat every second of mothering right up - - even the moments I feel most tired and inadequate. PS: I also think that it is a grand feeling to be fine with your family size. I struggle with that, because I don't want to be done, and don't feel prepared to be done. We were so ready for Isaac, and he died at birth instead. We wanted him so badly, to journey down that road again. I still hope for that chance again. I'm desperate for it. I think it's a wonderful thing to be able to be happy with what your life gives you. I hope some day I can feel that way, too. Awesome link, Lara, thanks. It's got my brain turning... maybe a post of my own in development. Wow! That hit home and I wouldn't even be found on google. I have always wanted to be a mother... always. Until we brought Emma home. She wouldn't nurse, I couldn't get her to sleep without holding her. She was jaundice, and oh so tiny. I always thought mothering would be easy for me because I had worked in daycares, because I loved children, especially babies. But mothering is hard... no matter who you are. You do need to put part of YOU aside and put MOTHERING in its place. Thank you Lara for sharing Emily's post. And thank you for being so amazing also. You are a wonderful example to me. I'm excited to read that post too! I gave up a lot of 'me' to become 'Mom'. Sounds like I'm in great company. Oh- and the Hubs shocked me 2 weeks ago with the 'we should have that other baby you always wanted' bombshell. Too bad he didn't arrive at that decision 4 years ago. It feels too late now. And, like you, it's pretty hard for us to get pregnant anyway. I'm totally cool with the 3 I have but if God wants to send us a miracle baby (because I'm pretty sure that's what it would take), we won't object. Thanks, Lara. I needed that link today. I've had so many of the same same SAME feelings. And I'm having them currently. Mothering is not easy, but either is being charitable, or having a pure heart. I think nothing much worthwhile is easy. Lara- thank you for sharing this post. It really put a coherent voice to feelings I've felt in the past/recently/right now. It's nice to know that not everyone jumps into motherhood and finds it true bliss. a) I think you have to come to the realization that your life is perfect how it is, and if your life adds another, it adds another. b) AS IF YOU COULD HAVE BEEN PREGNANT WHILE MOVING ACROSS THE COUNTRY. You should thank God you weren't. did I ever tell you my secret? Oh Lara, I love you. I admire your humility....and your strength. You are wonderful. Yay for spreading the love. You are a great writer, you know. I think your blog is great because you are a great writer, but not too wordy. It is tough for me to stay focused on overly long posts. I also appreciate your photography. You are one talented chica! I've been off the blogging radar for a few days now (off the life radar in general), but I just loved this post. Motherhood is such a complex thing. And truly so selfless. So nice talking to my sweet Brother today.